THE workout of all workouts to sculpt your lower body in the best way possible! This lower body toning workout combines both weighted and body weight moves to shape your thighs, booty, calf muscles, and more. A simple, yet effective fitness circuit you can do anywhere. I have never, ever known a woman that didn’t want killer legs and a perky booty. But I’ve known lots that didn’t want to kill themselves to get it- including myself 😉 You can run and stair-step and squat your way to a great lower half, but movements that truly challenge you, keep your body guessing, and use all sorts of different muscles in one single workout is the key to toning and sculpting everything waist-down. 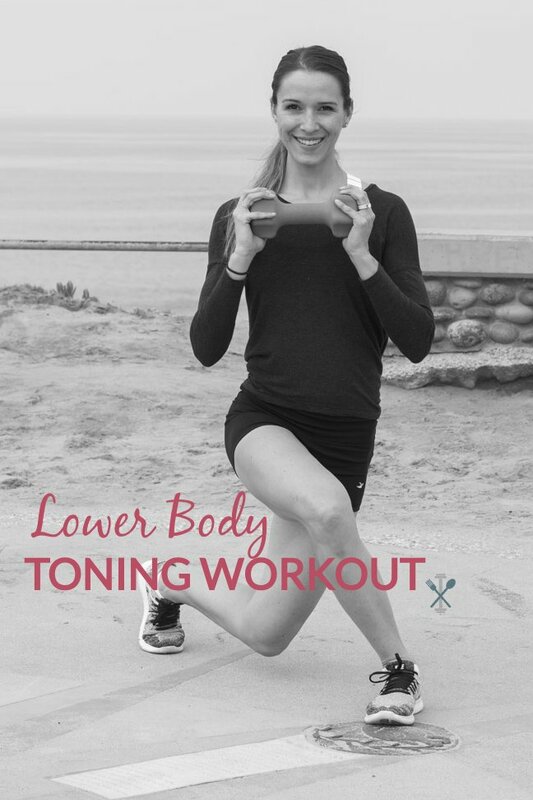 This lower body toning workout is fun, it’s different, it’s challenging. So grab a few heavy weights (I used 10 pound hand weights), or no weights at all! Let’s get started with this lower body toning workout! Grab two heavy weights and start with your feet hip-distance apart. Bend your knees to lower yourself down (pushing your booty back and making sure your knees don’t extent past your toes). Give yourself two counts to reach your lowest possible squat position, then two counts to come back to standing, pausing for just a split second for each count. Do this for 15-20 repetitions. 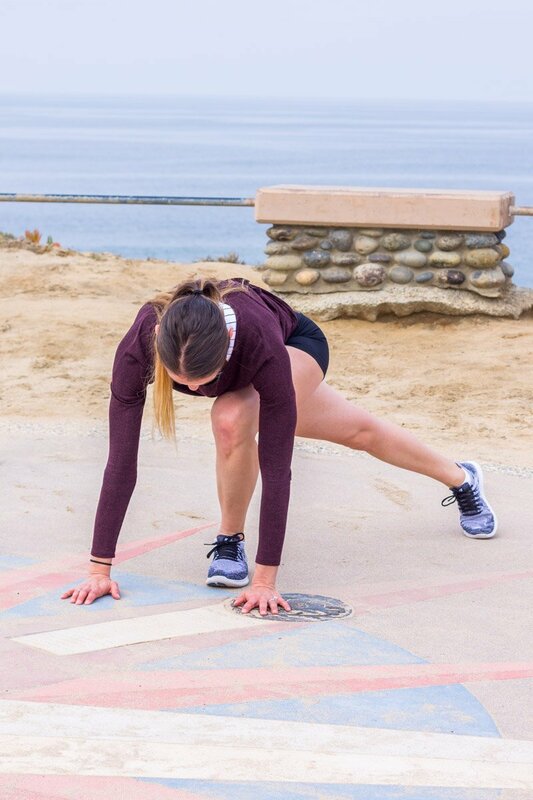 Step your right foot behind your body into a backwards lunge (left knee bent) and lower down so your palms are bracing the ground (hands directly stacked beneath your shoulders). Keep your right leg extended as you gently tap your right foot out to the 45 degree angle, then across the midline of your body to the opposite 45 degree angle. Continue this side-to-side tap for 15-20 repetitions (both side taps count as one). Then do the same thing on the other leg for 15-20 repetitions. Stand upright and place your hands in a prayer position, directly in front of your chest. Step back with your right leg and sink into a low lunge position. Next, swiftly lift your right leg off the ground (still behind your body), keeping a slight bend in your left knee while your right leg is elevated and fully extended. Squeeze your booty at the top, then place your right leg back down and return to the lunge position. Do this for 15-20 repetitions, then switch legs. Stand with your feet wide apart, toes facing outward and knees stacked directly above your ankles. Bend your knees to lower your body and place your hands in prayer in front of your chest. Lift your right heel off the ground and stay on the ball of your foot as you gently press your body even lower to the ground. Next, lift your upper body a few inches then back down as you switch feet, alternating the heel lift every time you pulse downwards. Do this for 15-20 repetitions, counting both the right and left heel lift as one. Grab one heavy weight and hold it directly in front of your chest. Step your left foot behind and across your body and lower down. Hold the weight in front of your chest the entire time as you extend your legs and sweep the right leg up and out to the side, bending at the knee. Lower your right leg back down and across your body to the curtsy luge. Do this for 15-20 repetitions then switch legs. YOU DID IT! Fab job – now time to repeat. Do this 3-4 rounds of this lower body toning workout, adding or subtracting the amount of repetitions as your fitness level allows. Beginner? Start with 10-12 reps instead of 15-20. Be sure to share this with a friend or two that needs a great sweat session you can do anywhere. Love workouts just like this? Then you have to check out this 30 Minute Home HIIT Workout, 50 Pyramid Workout, Garage Total Body Circuit with Dumbbells, Summer Workout Series: Total Body Tone, or the Sculpted Barre Arms Workout! Just completed this workout! Woohoo! Went with between 10-12 reps and used 8 lb weights and man… my legs are shaking!! Great, quick, at-home workout that gets your heart rate up!